People often ask me, what are the best azaleas to grow? I always tell them – go for the oldies! Because where azaleas are concerned, the oldies really ARE the goodies, if what you want are big, strong, floriferous and reliable plants to fill a space or make a show. 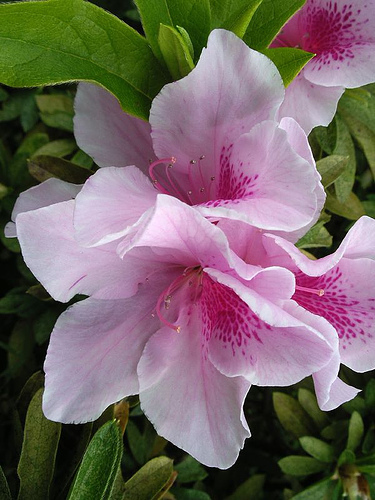 In this regard, the old indica species azaleas such as “Alphonse Anderson”, “Alba Magna” and “Exquisite” still out-perform every other type. They go on blooming year after year, decade after decade, and all they require is a bit of water in very dry weather, regular mulching with acidic stuff such as leaf mould or straw, and a good cut-back after flowering. Of course, there are lots of lovely azalea varieties available today in all sorts of colors. And when it comes to selecting varieties of indica, mollis or kurume much depends on your climate – as a general rule indicas are the best for warmer climates while the deciduous mollis and compact kurumes thrive only in cold or upland climates. Azaleas have been so hybridized and genetically mucked about that the range available in a garden centre can be bewildering, unless you have a definite color scheme in mind. The faithful old tall-growing indicas already mentioned here don’t produce autumn flowers, as do so many of the newer hybrid varieties . But though they only flower in spring (with occasional – but rare – spot flowering throughout the year) they do produce a good show for several weeks. And they are much less prone to petal blight and just plain dropping down dead than the newbies, where breeding seems to be aimed more at bringing out yet another flashy-flowered brief sensation rather than a vigorous plant.